The college baseball season is entering its fourth week of play, yet a blanket of snow covers a majority of the northern part of the United States. College baseball teams from Minneapolis to Maine and all points in between are annually forced to flock to Sun Belt states to open their seasons, which begin in mid February. The Big Ten is again floating an idea to allow college baseball teams to play regular season games during the fall that would count against their spring 56-game limit and toward their regular season record. The fall games would cut down on early season travel and loss of potential home games for northern conferences that include the Big Ten, the Big East a portion of the Big 12 and other smaller conferences. B1G sent an email to the Associated Press this week saying its coaches had voted to continue to study the possibility of fall games as it continues to look for support for the idea from coaches around the country. Notre Dame head coach Mik Aoki knows all too well the issues of coaching in the north. 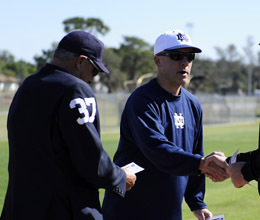 His previous stops include Boston College and Columbia and he is in his third season with the Irish. Notre Dame will play its first 17 games of this season in four states (Florida, Louisiana, North Carolina, and California) and six different cities before its March 22 home opener. The Big Ten has floated the idea, which was first proposed by Purdue head coach Doug Schreiber, over the last few years and it has largely fallen on deaf ears to coaches around the country. The conference has also threatened to start its own post season tournament as a counter to the College World Series, because it says its teams are at a competitive disadvantage due to geography. Aoki’s biggest beef with B1G is that while it has continually cried foul over the issue of geography and the weather that comes with it, conference members have also lagged behind in putting resources into its baseball programs. Purdue and Indiana will both play in new baseball stadiums this year, but even Cincinnati and non-BCS schools like Tulane, Texas State and Missouri State have played in more modern facilities for years. The Big East is a conference whose schools sit just as far north as those in the B1G, but Aoki says Big East coaches took their own straw poll on the proposal about a year ago and voted against the idea of scheduling official fall games. It came down to what amount to resource conflicts. While Aoki’s East Coast roots (raised just outside Boston) may make him cynical to the B1G’s ulterior motives he does see some upside to the idea of playing regular season fall games. He sees more upside to the overall promotion of college baseball than necessarily northern competitiveness. Notre Dame did actually host USC in 2005. Those games took place in May when the Trojans were able to make the trip, because it coincided with a conference bye week for both teams. It was a return trip after the Irish had gone to L.A. to open the 2004 season. That visit by USC marked the last time a traditional “sun belt” team has trekked to South Bend. Football weekends at schools like Notre Dame, Michigan, Purdue and others in the B1G footprint have the most to offer teams from the south with such opportunities. The Wolverines are scheduled to host Oregon State on the gridiron in two years, and a Sept. baseball series in Ann Arbor between the two would be both an attractive matchup for both teams as well as much more likely to happen than a Feb. series on either home campus. Notre Dame has the most to offer from attractive matchup standpoint with traditional southern schools. Oklahoma is coming to Notre Dame Stadium in 2013 and UCLA visited in 2006. Both have been to the College World Series in the last three years and Notre Dame will play them both this weekend in Los Angeles. The chance to host either in an October regular season game would be more likely to happen than either going north during the spring any time soon. Several schools – Vanderbilt, Texas and Cal State Fullerton to name a few – have played fall exhibition games recently. Notre Dame and Michigan State have played in recent falls as well. Those games do not count toward spring records, but they do count against the 56-game limits. Aoki does think there needs to be some governance if fall regular season games ever do become a reality. Aoki believes the minimum and maximum game counts need to be in place to ensure schools in the south actually participate. Otherwise, there would be no real incentive for traditional power schools like Texas, LSU and Florida State to play in the fall, because playing home games in February is not a concern for them. The last time a B1G team advanced to the College World Series was 1984 when Michigan advanced to Omaha for the last time. That trip ended the Wolverine’s run of five Omaha appearances in a seven-year span. B1G’s claims of competitive imbalance in regards to northern teams are not completely without merit, but the recent success of other northern schools in recent years mutes those cries. Kent State and Stony Brook both went to Omaha last year and neither has the resources of a B1G institution. Kent State’s CWS run began by beating Purdue in the NCAA Regional the Boilermakers hosted. Big East schools Notre Dame and Louisville have both been to Omaha since 2000, and St. John’s, UConn and even Michigan have come within an eyelash of advancing to college baseball’s promised land in the last few years as well. Notre Dame currently shares its early season geographic challenges with the majority of its Big East brethren (Louisville and South Florida both play February home games), but that will change with Notre Dame’s impending move to the more February friendly ACC. Aoki sees “no chance” ACC coaches will vote to approve fall regular season games.